The Trade collecting Top Cow’s excellent Broken Trinity x-over now also contains all of the associated First Born stories. I must say, I was never a big fan of Witchblade but Top Cow changed my mind with the stories contained within this volume. Press release and Stjepan Sejic’s great cover for the hefty collection, below. Top Cow Productions, Inc. proudly announced today that they will be expanding the deluxe edition hard cover containing Broken Trinity to include First Born. 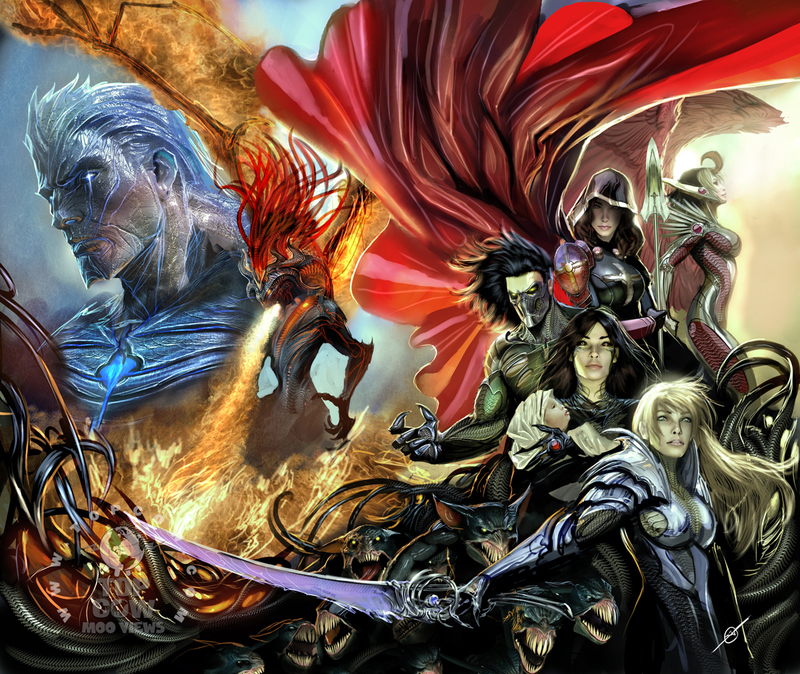 The limited edition volume will now contain both epic crossover miniseries that forever altered the course of the Top Cow universe. Presented in a new oversize prestige format, the 352 page First Born/Broken Trinity Deluxe Hard Cover collects all three issues of Broken Trinity, the three tie-in issues featuring The Darkness, Angelus, and Witchblade, and Broken Trinity: Aftermath. In addition, the collection will now also include all three issues of First Born as well as the Harvey Award winning tie-in issues of Witchblade #110–112. The hard cover also reprints the previously uncollected First Born: Aftermath, making the entirety of the First Born epic available in a single volume for the first time. The First Born/Broken Trinity Deluxe Hard Cover reprints the ground-shaking stories from current Witchblade creative team of writer Ron Marz and artist Stjepan Seijic and current The Darkness Phil Hester. The story of First Born explores the conflict between the forces of Light and Dark as New York City Police Office Sara Pezzini prepares to give birth to her first child. Desiring a tip of the power balance in their own favor the forces of Light and Dark covet the offspring of the Witchblade bearer! Broken Trinity acts as a thematic bookend, when a new Angelus bearer rises and two brand-new Artifact bearers make their first appearance in the Top Cow Universe. With new players on the board upsetting a delicate balance, a Trinity will be broken and one bearer will die. The First Born/Broken Trinity Deluxe Hard Cover is fleshed out with art by industry heavyweights Luke Ross (Captain America), Stephen Sadowski (Avengers/Invaders), Rick Leonardi (Vigilante), Kevin Nowlan (Wednesday Comics), Mike Mayhew (Blackest Night: Tales of the Corps), Lee Moder (Dragon Prince, Red Sonja), Jorge Lucas (The Darkness), Brian Stelfreeze (Wednesday Comics), Nelson Blake II (The Darkness), Tyler Kirkham (Fusion) and Ryan Sook (X-Factor). Additionally, the oversized 9” x 12” slipcased hard cover will feature an extensive behind-the-scenes section delving deep into the development process, a new wraparound cover by artist Stjepan Sejic, and a 24” x 36” full color poster. Orders for the previously solicited First Born Deluxe Hard Cover will be cancelled through Diamond and retailers will have an opportunity to adjust their orders for the new First Born/Broken Trinity Deluxe Hard Cover through Diamond’s FOC program.